The Retirement Bucket List is of your Retirement Wishes, before you ‘kick the bucket’! One of the concerns of people in their fifties and older- and facing retirement is that of running out of time. Think about the last ten years ... you will probably feel they have passed too quickly. We are into the second decade of the new millennium! What will your life situation look like 10 years from now? We can measure time with clocks, watches and calendars, and yet we experience time subjectively. I am sure you can think of lots of examples of situations in which time seemed to move very quickly, when you are enjoying yourself, or very slowly when you are bored or stressed. Contrast your perception of time if you were sitting on your partner's lap, versus sitting on a hot stove! We need to make the most of our time because it passes so quickly, especially when we are adults. At the age of ten, a year seems like a decade, at 60 - a brief interlude. Sooner or later we realise that we never have enough time to get everything done, but we have enough time for what matters most. Your life situation today is the result of decisions you have made in the past, including decisions on how to spend your time. In retirement planning you have the opportunity to make new choices about how to make the most of the time you have left. 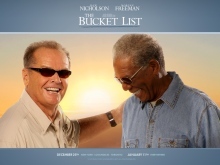 There’s a movie called The Bucket List, starring Jack Nicholson and Morgan Freeman, both of whom are diagnosed with a year or less to live. Sounds depressing, but it’s actually a feelgood film about time. Blue collar worker Carter Chambers (Freeman) and millionaire hospital magnate Edward Cole (Nicholson), are very different characters, who have two very important things in common-the need to come to terms with who they are as a result of past decisions, and the urgent desire to make the most of the time they have left. What would you like to do, before you 'kick the bucket? I reviewed the movie's retirement bucket list list and found that I had a lot in common with those two guys! I was delighted to discover that I had already done several things on the Movie's Retirement Bucket List , or had done something equally challenging and exciting according to my interests and values. That exercise reminded me how easily we forget all that we have achieved and experienced and how good life has been. We have so much to be grateful for, but also so much to look forward to ... so I compiled My Bucket List! My list, and the movie list, contains some great retirement ideas for retirement lifestyle planning, including retirement hobbies. They certainly imply active retirement living and they may set you thinking about retiring young, or at least young at heart! The retirement sentiments and retirement wishes expressed in the lists would surely help you to retire happy. What are you going to put on your retirement bucket list? This is a fun exercise, but be warned ... if you want it to become a reality and not just a fantasy or wish list you need a strategy for goal achievement. In my retirement coaching practice I help my clients in get on top of their everyday issues and challenges, develop a clear forward direction and support them in starting and maintaining momentum. ‘The world is a fantastic place full of people you want to meet and things you would like to put in your mouth. There are places to go and things to do and stuff you would like to try. But your time here is extremely short so you must rush and never say no to anything.’ Jeremy Clarkson. Do you agree? And now - Time to Make Out YOUR Bucket List (and share it) - as well as having a look at the retirement wishes of others. Stay in touch and subscribe to my monthly email newsletter, Retirement Stories. It is full of new stories and tips on planning for and enjoying an active retirement.